Evelyn's cousin Hannah likes to help her mother in the kitchen. Evy likes to do the opposite. 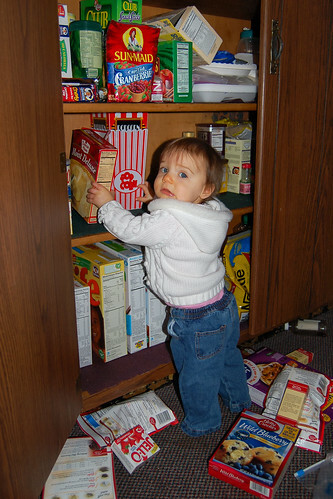 This morning she emptied the better part of the bottom two shelves of the pantry. We think she was drawn in by the big box of Cheerios. Or maybe she wanted to make some cupcakes. Or maybe she was just having fun throwing things around the kitchen. Just wait until Evy can open the refrigerator door. I have vivid memories of a certain little girl (who is grown up now) sittting in front of the refrigerator in her Mechanicsburg home with a gallon of milk spilling on the floor. She was right in the middle of the milk, playing like she was in the bath tub! She probably wanted to take a milk bath for her complexion! 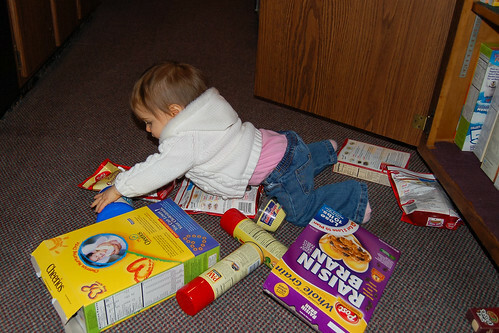 Evy would also help you clean up the plastics/tupperware drawer and the pots and pans. Great pictures! Ha! You and Holly have me cracking up this morning.